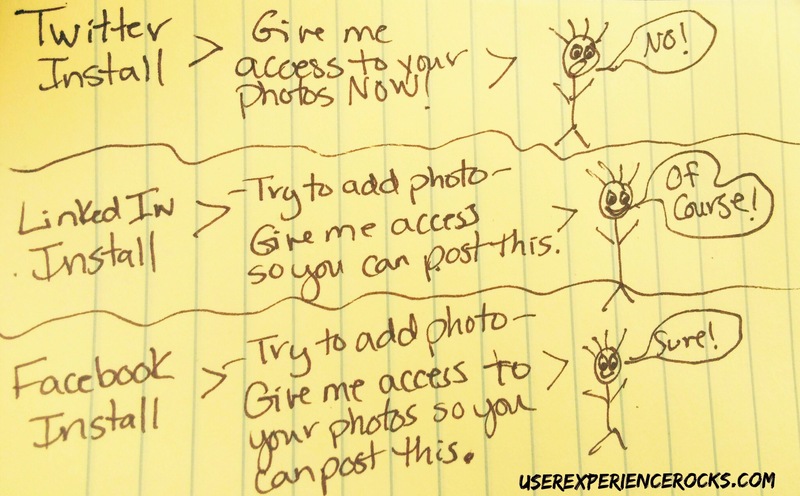 Stop Asking For Photo Access During The App Install Process! I deleted Facebook, Twitter and LinkedIn, then reinstalled them once my phone finished updating. During the reinstall process I discovered a shocking truth. One of my most used apps, Twitter, STILL asks for photo access immediately after install! And it still feels shady and invasive. I immediately said no, even though I upload pictures to Twitter pretty much daily. It’s a definite UX fail, which bums me out because they made some really fab enhancements this release. I’m loving being able to click on sender faces to open their profiles in the messages area. It’s a beautiful UX change. I’m loving the new profile look and feel too. LinkedIn and Facebook both did the right thing, and waited to ask for photo access until I actually wanted to add a photo to a post. At that point it’s just a natural feeling part of the upload flow. Since Twitter was all sketchy at install, when I finally did want to post a picture I got that annoying message telling me I’d need to go through the 92 step process required to enable it. As UX pros, can we all just agree that asking for photo access during install is just generally obnoxious? It creates a negative initial user experience and creates a feeling of brand distrust right off the bat. Small details like privacy setting request flows can have a big impact on brand trust. Stop making your brand seem seem untrustworthy by fixing your on-boarding experiences! Yep! I agree. Seamless is seamless, and you definitely brought up a seam in the Twitter update process for you. I think sometimes power users are fine because it gets all the permission at once and they might consider it a form of “batching” the permission granting tasks. But overall right on! You have a mobile native app! Great! But why?! Sheetz UX Fail: What Exactly Are You Trying To Dry?